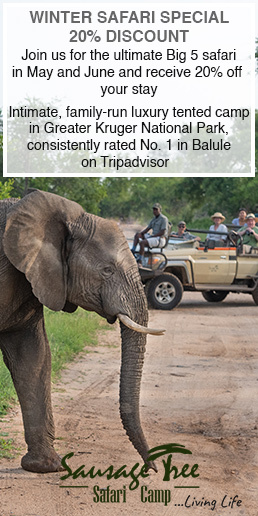 It was our last day in the Kalagadi Transfrontier Park. 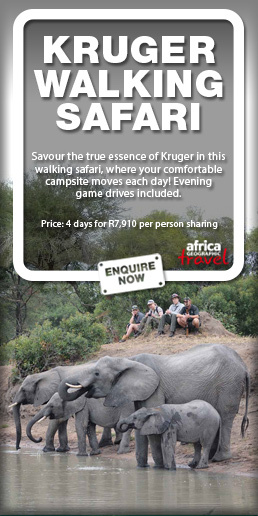 We had seen three cheetahs just north of Leeudril waterhole and were driving south towards Twee Rivieren Rest Camp. About one kilometre south of Leeudril we heard a commotion. I immediately stopped and parked my car to investigate. The commotion seemed to be coming from Sharifa’s side of the car and peering through the window we could see a black-backed jackal and a Cape fox. The screeching and howling coming from the animals was intense as we tried to register what was actually going on. 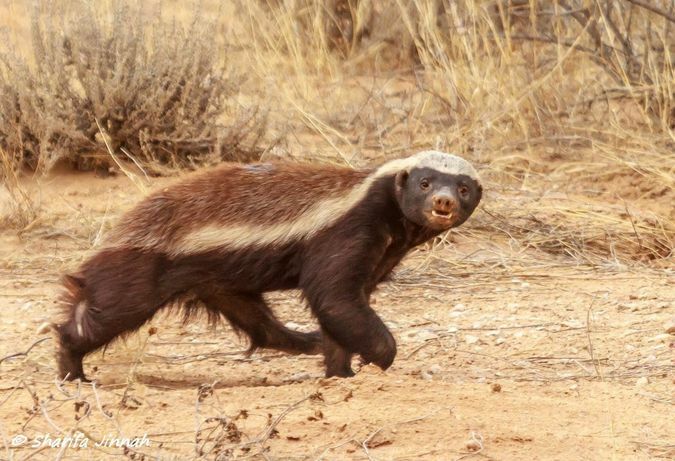 The next thing a honey badger came running out from behind the bush with a Cape fox in hot pursuit! 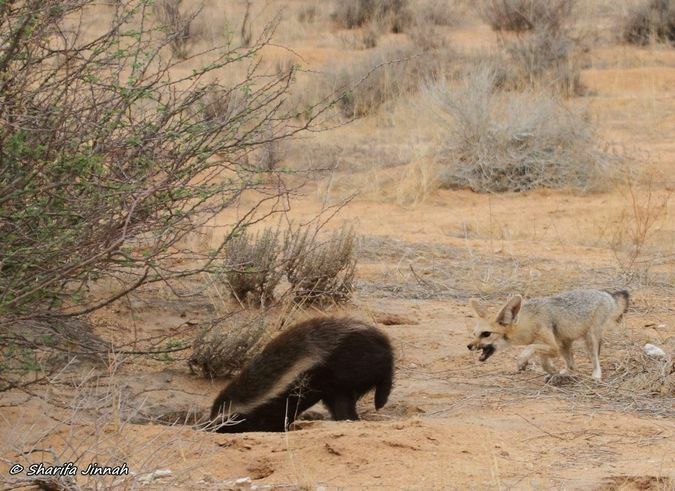 The honey badger, ignoring the Cape fox, made a beeline for the fox’s den and started digging away trying to get to where the Cape fox kits were. 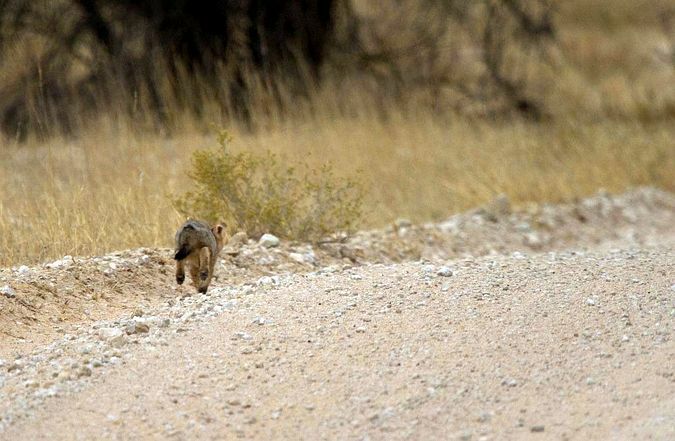 Fortunately for the kits, their parents were working efficiently as a team to ward off the honey badger. One would bite the badger from behind and dart away as he turned around, then the other would give chase and try to get a bite in from another angle. 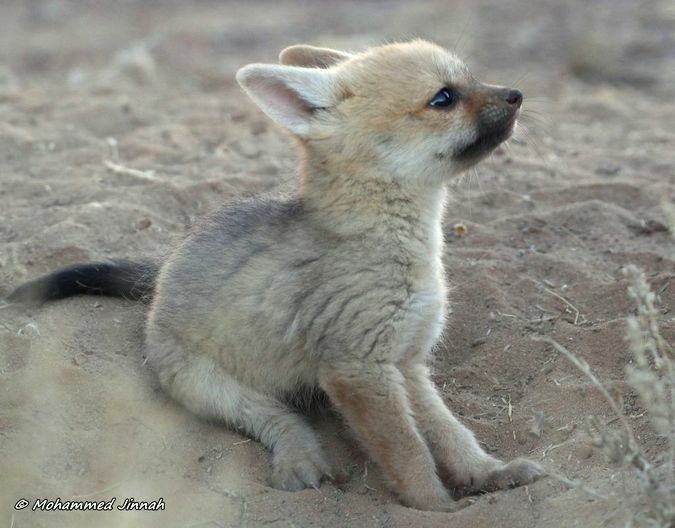 Both Cape fox parents were screeching and barking in anger as they defended their kits and the den from the honey badger. 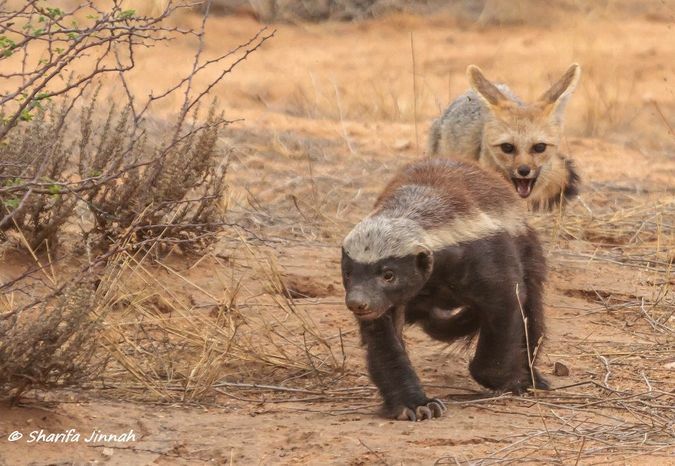 Meanwhile, the black-backed jackal waited patiently in the background, not wanting to get involved, but clearly hoping to get a meal out of this – forever the opportunist. 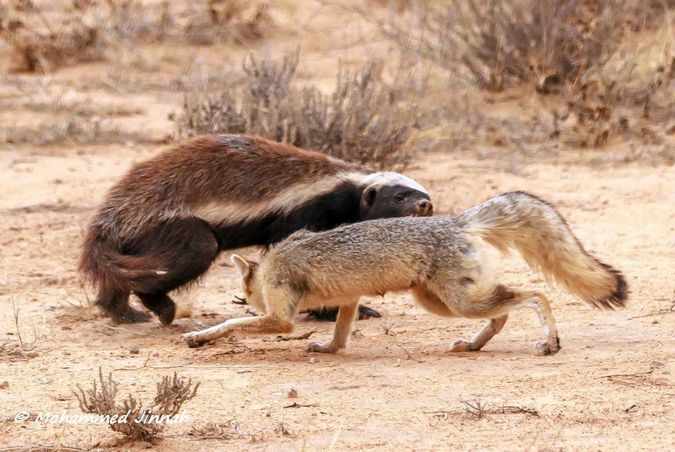 The honey badger was not giving up easily however, but the Cape foxes were putting up a brave fight. Suddenly one of the kits found its courage and came out from one of the entrances of the den, but then quickly disappeared down another in a whisker! A few minutes later the second kit came out and bolted down the road. 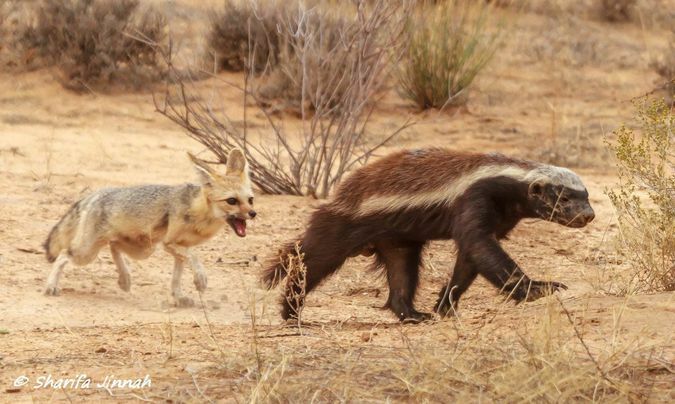 Fortunately, neither the honey badger nor the jackal saw it running away. 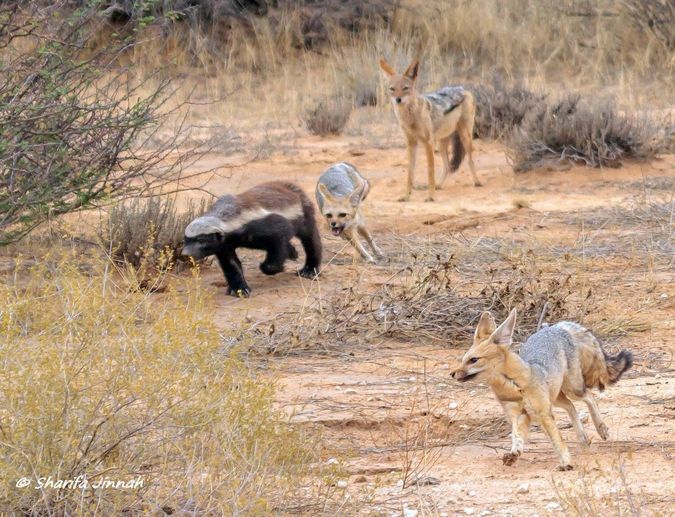 The attacks from the Cape foxes were frustrating the honey badger, and he realised that there was no easy meal here, so he made a retreat, leaving the Cape fox family in peace.